The Treaty Oak is an octopus-like Southern live oak in Jacksonville, Florida. 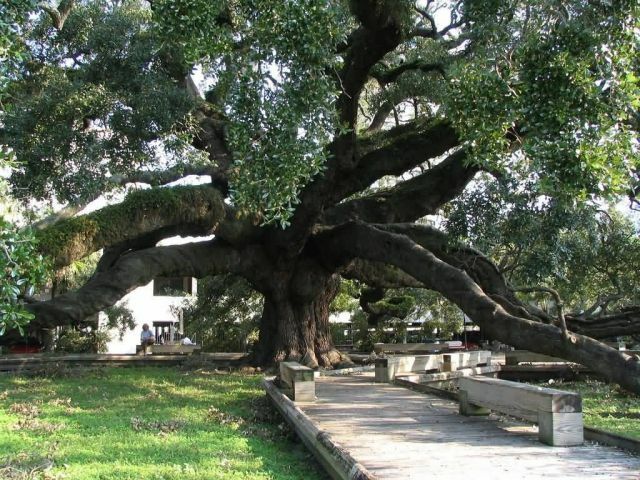 The tree is estimated to be 250 years old and may be the single oldest living thing in Jacksonville, predating the founding of the city by Isaiah Hart during the 1820s. It is located in Treaty Oak Park in the Southbank area of Downtown Jacksonville. The tree has a trunk over 25 feet in circumference, it rises to height of 70 feet and its crown spreads over 145 feet with twisting branches that bow to the ground and curl back up. The oak shades a roughly circular area, about 190 feet in diameter.The name is generally believed to be related to some local apocryphal stories about peace accords between Native Americans and Spanish or American settlers signed under its branches. In reality, the name was created by the Florida Times-Union journalist Pat Moran who, in an attempt to rescue it from destruction by developers, wrote an article in the early 1930s claiming a treaty had been signed at the site by native Floridians and early settlers and called it Treaty Oak.